Pagans around the world celebrate the birth of the Sun and Yule for centuries. 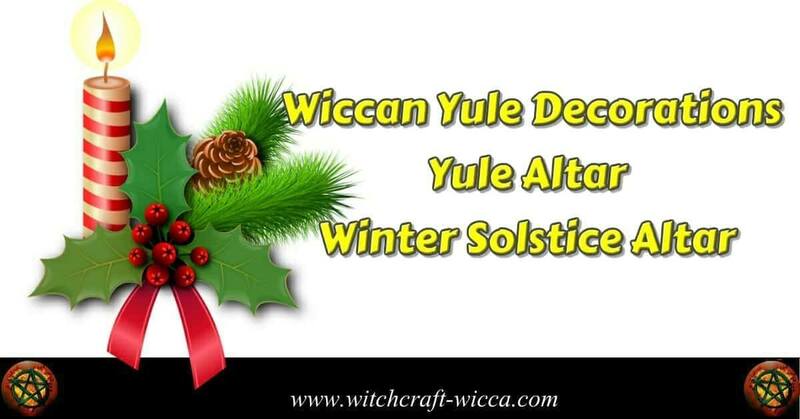 Christmas will continuously find roots in pagan traditions with Wiccan Yule decorations. This birth of the Sun, as in the star in the sky, will bring us new warmth. Get your Winter solstice altar ready to reach, pull in and harvest that energy. Create a Yule altar, something that symbolizes your purity, spiritual growth, and development. You can go with different themes, as a blank slate is a new beginning. Use the idea of snow colors, white sand or silver items. Hang white snowflakes around your home to keep the spiritual environment clean. The white color design reflects purification and your fresh start. Use a cloth in a fresh color to cover your altar. Make a seasonal smudge stick, bundle herbs together, tie them with string, and allow them to dry out, ready to be burn later. Yellow candles, gold discs, any bright and shiny decoration can represent the Sun. Inscribe solar symbols on a large pillar candle, and assign it as your Sun candle. Add evergreen sprigs of holly, boughs, a Yule log, pinecones. Wiccan Yule decorations like Santa Claus, antlers or reindeer mix well with other symbols of fertility. Add to this Yule altar light of your candles. Sit with its energy to enhance the sacred space and bring this whole new spirit into the new solar year. A gold candle can symbolize the Sun on your altar. Use candles in a variety of different wintery shades, in sparkle silvers and golds. Use cold colors such as silvers, whites, and blues. Include red, and green to decorate your altar and add some dark evergreen as well. Do not exclude the red color during this season. Red is connected with passion and sexuality in modern Pagan magical practice. For some people, the red color indicates prosperity.